No monkeying around...Even if this ultra-stylish-party-planning-guru-momma wasn't my best friend, I'd still want to be her! Parties and her children have to be her favorite things in the world, so you can imagine the excitement around their own big days! The Monkey idea came from my CRAZY daughter who climbs on everything! A few months before her 2nd birthday she was introduced to the "5 Little Monkey's Jumping on the Bed" song and book. She absolutely loved it and a party theme was born! As I started brainstorming I saw SO many monkey parties. I loved the invitation I designed with Hayley that incorporated my color scheme of pink and brown, with the hanging "girly" monkey, and also polka dots, which are special to us since that was the theme of our daughter's first! Martha Stewart has an entire line of "ready to make" things for a monkey, and at the time Target had everything we needed to tie the theme together. From plates, to the kids cups, a cute pitcher, monkey stickers to put on the walls, we were overwhelmed by all the stuff that was monkey related! And of course there has to be jumping around at a monkey party, so although I think they are used in overabundance, it was very appropriate and the kids' favorite part! 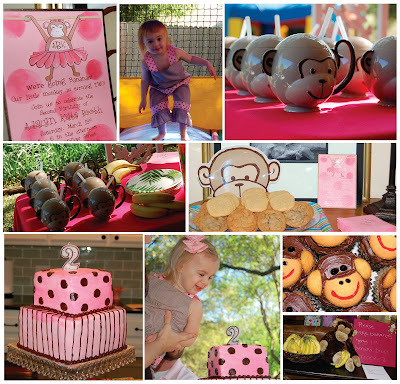 Also, I didn't think of this for my own party, but my friend Kristen threw a monkey party for her daughter, too, and gave away bananas and a recipe to go with them! She is an amazing baker and I have to think those favors were coveted by all the monkey mamas! Thanks for sharing your party with us! 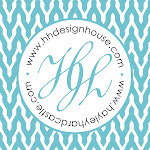 We loved getting to be a part of it and hope you are still cranking out the ideas for the kiddos when I am in need someday!